The only thing small about H2i is its size. 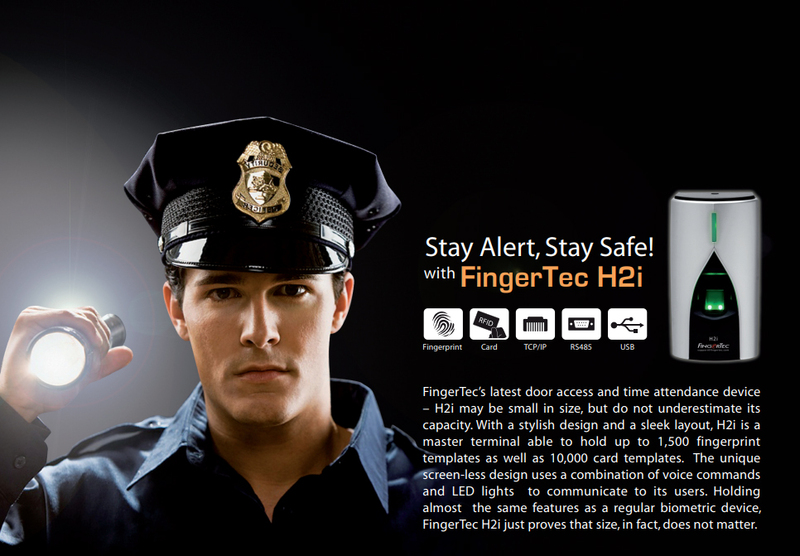 With 1,500 fingerprint templates and 10,000 card templates, H2i can be hardly defined as “small”. Enrollment for H2i is done with an administrator card. Just flash the card to enroll or delete a user. Plug the USB numeric keypad to H2i to enroll users, delete users, or reset the terminal to its default settings. H2i, being a minimalist, is still able to communicate to you via its variety of voice commands combined with its multi-colored LED signals. Who says you can’t be stylish? The simple and sleek design of H2i looks good in any setting of a workplace! Increase the security at your workplace by installing an external alarm, and be alerted during unexpected scenarios such as break-ins and fire emergencies. VOICE LANGUAGE (TERMINAL) English (Standard)/ Other lauguages are available upon request.